More than 400 teams and thousands of spectators are expected at the 27th annual championships at the Camden Snow Bowl Feb. 10-12. 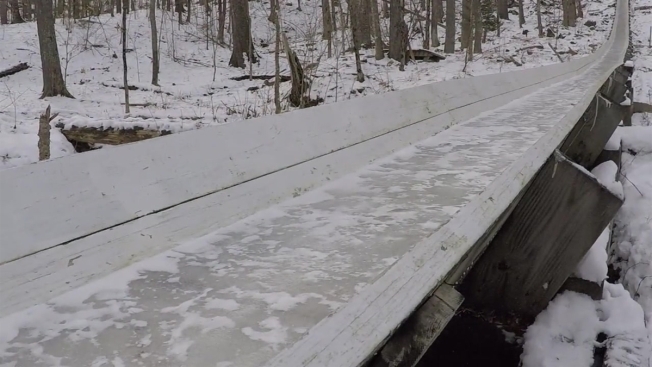 Oh chute – the U.S. National Toboggan Championships are about to go down in Camden, Maine. “The sudden drop, the excessive speed. It’s the most exciting eight second of your life,” said toboggan racer James Tyler, who has been competing in Camden for 17 years. He said it’s an addicting thrill: going down the 400-foot long chute at nearly 40 miles per hour. “It’s maybe scary at first, but after that, you want to do it again,” he said. “It’s a huge economic boon for the community,” said toboggan championship Chairwoman Holly Edwards. She said the best thing about the toboggan race is that anyone can compete – and win. Some of the racers do take the sport seriously. “They are waxing and buffing those toboggans up until the last second,” said Edwards. She said organizers can chill this year – knowing that the weather seems to be ideal for the race. Last year, record high temperatures melted the ice, forced the competition to change locations, and threatened to derail the beloved tradition and crucial fundraiser for the town-owned Snow Bowl ski area. Registration for the event has been extended to Feb. 8th. More information can be found at camdensnowbowl.com.